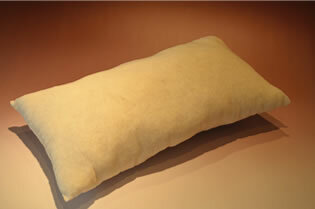 Minimum quantity for "Kakimoko pillow (26cm x 48cm)" is 1. Kakishibu has a high deodorizing effect and the ability to break down harmful substances, such as formaldehyde, a cause of sick house syndrome, and render them harmless. Kakimoko is a filling dyed with the powerful kakishibu. 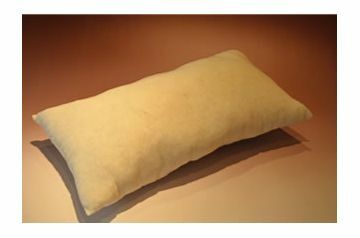 With its comfortable touch and the potency of kakishibu, this soft fluffy Kakimoko, which is widely loved by all people from babies to the elderly, delivers safety and security to people's lives. What is kakishibu with which Kakimoko has been dyed? Kakishibu is created by fermenting the juice extracted from immature persimmons. It has a brown color and a unique smell. Since ancient times, it has been used as a dye for wood, cloth, and papers, reinforcing agent, antiseptic agent, and waterproofing agent. Moreover, in folk medicine, it has been used as a hypotensive drug, remedy for burns and chilblains, anti-hangover agent, agent that neutralizes the proteinaceous toxin of poisonous snakes, and clarifying agent for sake. The main component of kakishibu is macromolecular persimmon tannin, and as the elucidation of the versatile potency of persimmon tannin advances, the application of kakishibu in various fields has attracted attention. Power of Kakishibu　The main component of kakishibu is persimmon tannin. Kakishibu has a strong deodorizing action. The results of an odor removal performance test, including ammonia odor, body odor of the elderly (nonenal), and foot odor (isovaleric acid), showed that Kakimoko is effective in removing unpleasant odors (see the sheet below for the test results). Kakishibu is suited for use in medicine, nursing care products, pet products, and sporting goods. The number of people with atopic dermatitis and allergies is increasing each year, and it has become clear that indoor environmental pollution from chemicals is the cause of such symptoms—the so-called sick house syndrome. Kakimoko decomposes formaldehyde, the major cause of sick house syndrome. Using Kakimoko cushions and pillows will help decompose chemicals and achieve a safe living environment (see the sheet below for the test results). Kakimoko is created by dyeing a filling with kakishibu via special techniques. Different from the conventional kakishibu dyeing method, which stiffens the filling, Kakimoko is fluffy and soft to the touch.